Ok...i know I am soooooooooooooo late jumping on the bandwagon about this one. 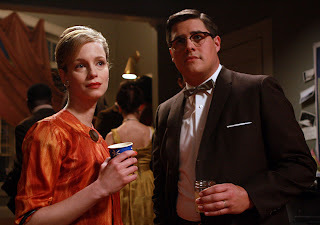 And now I am almost obsessed with this show on AMC...Mad Men...about the advertising men of Madison Avenue in the late 50's early 60's. I absolutely love the aesthetic of this time period and this show! I am very glad that I became a woman after the 70's ! I would have been the beatnik artist chic during this time. A Kerouac fan that I am, I would have loved to have been a rebel during this time. I have to say I'm a bit pissed that no one told me to watch this show! Thank God for on demand so that i can get caught up. Its been nominated for more Emmies than any show ever nominated and I can see why. So go check it out if you haven;t yet. If you love the retro feel I keep trying to produce in my work....check it out! If you're trying to quit smoking or drinking cocktails during the day....maybe not check it out!